This article is excerpted from a piece in the Washington Post by Darryl Fears. You can find the original article here. We find this litigation interesting as a number of states fear the precedent set by the Administration's efforts to end pollution flowing into rivers that drain into the Chesapeake Bay. This effort allowed regulation of farmers and sewers in areas as far away as Central Pennsylvania and West Virginia. As an organization focused on healthy estuaries, we see the value in looking to reducing upstream water pollution sources as downstream solutions such as oysters cannot eliminate it all. Additionally excessive pollutants can preclude the presence of oysters or make oyster restoration harder to initiate. 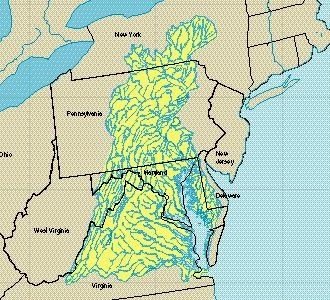 Chesapeake Bay Estuary accepts water from areas far away. State attorneys general from as far as Alaska and Montana joined the American Farm Bureau Federation in its fight to prevent the Environmental Protection Agency from carrying out its plan to clean up the nation’s largest estuary. Impaired waters have led to fish-killing dead zones and other marine life die-offs for decades. The states involved include Michigan, Florida, Alabama, Arkansas, Georgia, Indiana, Kansas, Kentucky, Louisiana, Missouri, Nebraska, North Dakota, Oklahoma, South Carolina, South Dakota, Texas, Utah, West Virginia and Wyoming. Maryland and the District were eager for a cleanup, but other states were reluctant. Using its powers under the act, the EPA threatened to withhold permits that would have limited construction projects and allowable sewer releases if the states did not come up with individual pollution-reduction plans by a December 2010 deadline.